Wawel - The Hill of Fame. The photo displays the Wawel Cathedral - 2 photos stitched. 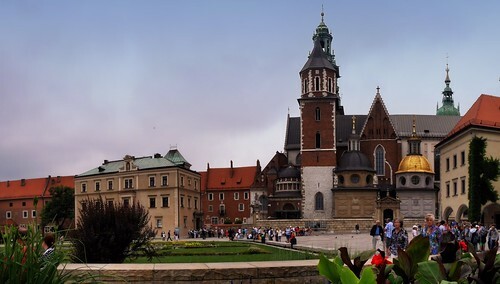 Wawel Hill in Krakow, the mecca of every Pole and a must for foreign tourists, is a microcosm of Polish history and culture. From the 11th century on Poland's monarchs took up their residence here in the Royal Castle. And they were both crowned and buried here, in the Wawel Cathedral where later on Polish national heroes have also been laid to rest since the 19th century. The place not only overflows with priceless art treasures, architectural beauties, relics of the past and curiosities. It is also full of glory, magic, history and fable.